The latest version of SysInternals‘ excellent ProcessMonitor is now able to receive custom debug log messages and display them right in between the I/O logs. Even though I still don’t quite get the rationale for the need to create a new API for this (in contrast to simply merging in the functionality of DebugView) I went straight ahead and converted the API to Delphi. This should work with Delphi 6 and later. I successfully tested with Delphi 2007, 2009 and 2010. The sub-entries will be named after the addin’s ProgID, e.g. “Microsoft.VbaAddinForOutlook.1” is one included by default with most versions of Office. From the name it should typically be fairly obvious which entry belongs to the particular addin that you’re after. For the purpose discussed here it is irrelevant what values these sub-entries actually contain. As you may have guessed the entries under HKLM define which addins get loaded for all users while the entries under HKCU define the ones that should be loaded for that user only. Thus, in order to change an addin’s load behaviour from “all users” to “some users” all you have to do is essentially move the relevant entry from HKLM to HKCU, e.g. by exporting the entry into a .reg-file and then deleting it, then using notepad to change the hive to HKEY_CURRENT_USER and finally re-import that .reg-file again for the users that should use the addin (or just use a group policy object). Remember that you will have to repeat this whenever you install an update of the addin in question as that will probably rewrite the entry under HKLM. Marco has already blogged about it and now here is my report from this year’s Entwicklerkonferenz, aka Delphi Live Germany in Darmstadt. First off, I was pleased to see that attendance was definitely better than last year (where David I’s opening keynote was seen by about 30 people tops), though that might in part have been caused by the unfortunate hotel situation back then. I haven’t heard of any definite numbers yet but my personal estimation would be that there were slightly more than a hundred people this year (which is of course still way below the numbers of a few years back). During the opening’s obligatory hand-raising segment only two or three people indicated they were there for the very first time. A harsh contrast to the results of the Delphi Tage event earlier this year where about a third of the audience outed themselves as first-timers. A welcome gimmick (for me at least) was an offer for returning attendees of the conference to get a “free” netbook. Though I have to strongly object to the “free” part of the campaign (you had to waive the usual “early bird” rebates when claiming it, so effectively you paid more than you otherwise would have), this worked out really well for me as I did not own such a thing so far and it worked fine right out of the box. Another small thing that I found very nice compared to previous years was that in all conference rooms you were able to sit at an actual table (well, except for when they underestimated the attendance and had to bring in extra chairs which happened to me two or three times), which is not only more comfortable because of the additional leg space but also makes taking notes so much easier. This was a real eye-opener on many levels while being at the same time very entertaining and thorough. I especially appreciated how Hadi took the time to present the entire thought process behind the concept but doing so in a very subtle way that made it feel very natural how all the bits fell into place. Another very memorable bit of this talk was something that Hadi essentially tacked on at the end in response to a question from the audience: It was a one-liner for a .NET mocking framework that essentially returned a dynamically created (mock) object that implemented a given interface… it took a couple of seconds to sink in for me… this is just a little bit mind-bending if you really think about it. I want this in Delphi Win32! Now with the revived RTTI support in Delphi 2010 I think we’re already heading in the right direction that will eventually lead towards such functionality. I think every developer should go see this talk at least once (I think I’ve seen it three times now in various incarnations and it just keeps getting better). This time Ray also included some (IMHO) very valid concerns about recent changes in the Delphi IDE, especially the Options dialogs. I couldn’t agree more. Even though this was already a highly informative and entertaining talk in its own right this would already have been worth it just for showing SafeMM alone! You should check it out, too: It’s a special-purpose memory manager created used by the CodeGear debugger team (thanks Chris for the clarification) to catch improper memory access directly where it happens rather than having to wait for the symptoms of such mistakes. If I understood Daniel correctly it’s a branch of FastMM. Can’t wait to get my hands on Delphi 2010 after this talk even though I had seen some of the new stuff at CodeRage already. This is a major milestone! This is a really new and intriguing concept and a great approach for separating concerns and getting rid of repetitive code without actually hiding it. The whole “Unquote” thing remains a bit of a mystery, though even after having seen both talks. I guess it’ll probably become clearer as you actually write aspects yourself. Can’t wait to have aspects in Win32 even though I can well imagine that it will be some time before we see this as it will need really deep compiler support and I know what I would like the CodeGear compiler guys to focus on first instead (hint: there will be a 64-bit edition of Office 2010). I was a bit underwhelmed if not even a little disappointed with the presence and (perceived) involvement of Embarcadero Germany as compared to past conferences(! ), especially considering that they were again the Gold Sponsor of this conference: Their booth (which was pretty much hidden away behind a pillar) in the expo area was empty whenever I checked. They also didn’t advertise any conference rebates or raffle prizes as was customary in past years (though this post (in German) seems to suggest that a rebate offer might still be forthcoming by email). Another slightly unnerving thing for me was that the conference IMHO missed a proper sense of closure: The agenda did not contain a closing session to boot. After the last session the conference was simply over. I could do without the endless raffle drawing of past years (even though one is of course always secretly hoping against hope to win something worthwhile) but I would have preferred at least to see the conference end with a speaker panel and a closing statement from representatives of CodeGear and Software&Support like there always was in past years. I might only be projecting my own feelings at others but I was under the impression that I was not the only one who felt a little bit “ordered but uncollected” (as we say in German) while we were standing in the lobby realizing that this was it and we could go home now. Before anyone mentions it: there actually was a spontaneously(!) held raffle drawing but it started the very minute that the last sessions were scheduled to end (and we all know that speakers never exceed their time slots, don’t we) and lasted for about 15 minutes. By the time that I came out of the last session it was already over. Anyway, I am very much looking forward to EKON 14 and other community events that will hopefully be happening during the next 12 months. See you there! In the best case scenario it takes me at least ten clicks, 5 of which are redundant, and quite a bit of lucky guessing, to get from the “immediate purchase” link in the Delphi 2010 press release to a page where I see even so much as a price tag… and still left wondering whether this is even the best offer… isn’t that a bit… erm, how do I put this… ridiculous? Select one out of 32 arbitrary vendors from the Partner Directory (and be sure to click the link in the right hand column as otherwise you will have to click once more to actually get to the vendor’s page), many of which do not even appear to have an online shop at all as far as I can tell… Most do not even mention Delphi or RAD Studio on the front page. If you took a lucky guess in the previous step the vendor will have a direct link to the Delphi product page on its front page. If so, click it. Otherwise take however many clicks it takes you on that vendor’s page to select Delphi (again! – see 1.) from the product catalog. Click through to the page with the pricing information only to find out that, as usual, there is a whopping 43% premium for European customers on the Pro upgrade ESD! In the words of Donna Noble: You’ve got to be kidding me! That said, Delphi 2010 does still look like a worthwhile point upgrade from a technical POV… My sincerest kudos to the R&D team! A big praise to Daniel Wolf for organizing the “pre-con” barbecue at “cult” football club FC St. Pauli’s where we met in a nice setting with great food and a couple of nice cold beers where you could also chat pleasantly about non-programming, non-Delphi-related topics for a change, all in the middle of the vibrant (German part of the) Delphi community. The main event started on Saturday morning. Attendance was pretty high (over 250 people, including speakers and exhibitors, if I overheard that correctly). I was especially pleased to see so many “out” themselves as first-timers during the hand-raising section at the conclusion of the event. And the average age of the audience was also way lower than I have seen at similar events in the past which can only be a good sign, right? David I’s keynote offered little new to anyone who had been following the coverage of last month’s Delphi Live! conference in San Jose. It’s nevertheless always a joy to see and hear David talking. You just totally get that there is someone who’s truly got his heart in what he’s saying. After a quick break started the first round of sessions, whereas I myself unfortunately wasn’t able to see a lot of it as I had to leave during the coffee break to find a less pricey parking space for my car and only returned (quite out of breath and sweating) for the second half of Jeroen Pluimers‘ very hands-on talk about IDE-addins and other useful tips for increasing developer productivity. 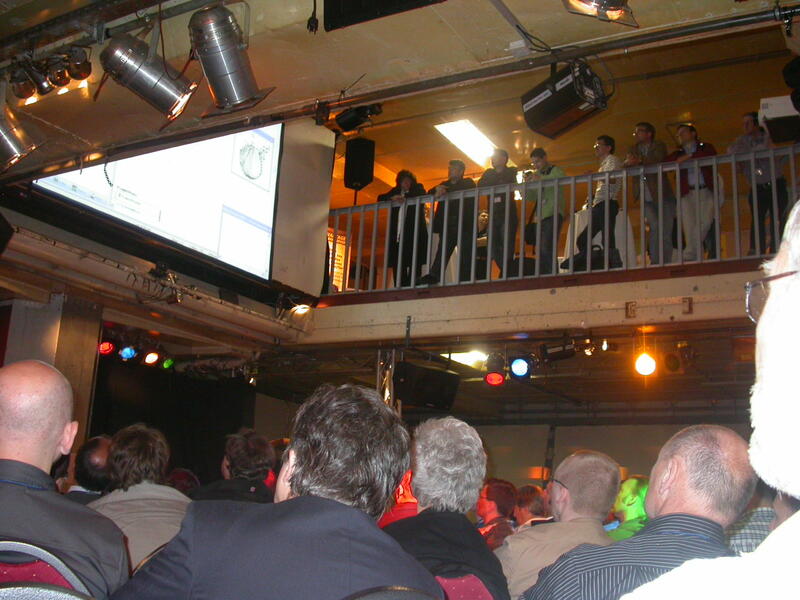 Though, as at that point the room was so full that I had to stand in the doorway to the adjoining second session room, where Bernd Ott was doing an equally interesting talk about Subversion I was only able to watch and listen with half an ear and eye. 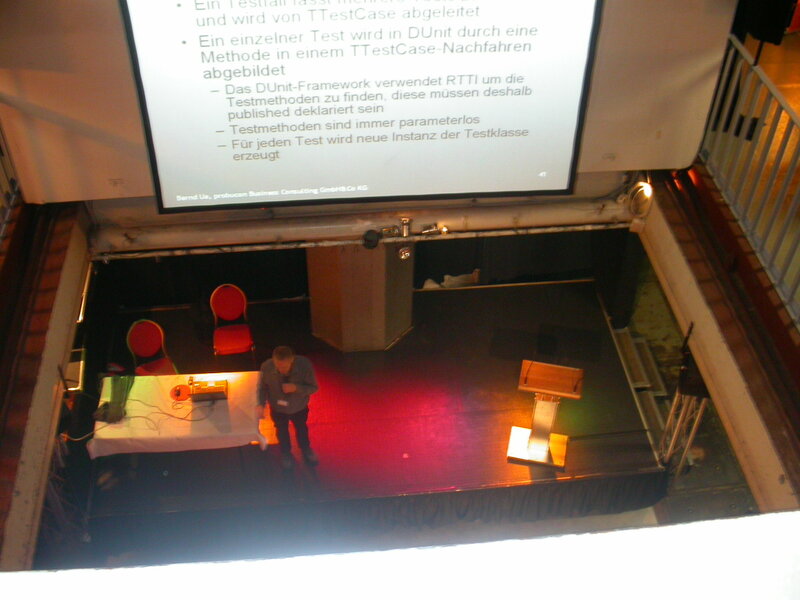 After that I went to see Bernd Ua’s talk about software testing and DUnit which I watched from quite an unusual viewpoint (see picture to the left). In the meantime the time for my own talk was rapidly approaching and as this was going to be the first of its kind since almost exactly 9 years to the day (minus a month), my tension was rising considerably. As a result I could unfortunately only watch the first half of Daniel Wischnewski’s entertaining talk about the Windows 7 Taskbar as at that point I had to step out for a quick breath of fresh air. My own talk then was a bit of a mixed bag: While I did manage to shed most of the nervousness and was able to answer all questions from the audience, I feel that in hindsight I probably made some less than ideal decisions about weighting the individual parts of the talk in an effort to get everything in there that I had announced I would cover. Sadly, time ran out on me even before I got to the concluding segment about Extended MAPI and Redemption so I could only hasten through the slides about those topics rather than actually show some practical examples. Well, one should learn from one’s mistakes. I will try to cover the bits that got a bit of a short end here on the blog in the form of more videos and also to do better at the next live talk. I hope everyone was still able to take away something interesting for him or herself. Please feel free to post any unasked questions here on the comment thread. The day’s finale in the Gröninger Brauhaus was quite pleasant and fun. In my mind the pub/restaurant visit at the end has really become a stock item of the Delphi Tage events in its own right. The first thing I found in my inbox when I turned on my computer for the first time since my return was a belated (actually, it had arrived a mere 30 minutes after I had left for Hamburg) email from the Add-in-Express team, containing a 30% rebate coupon for the attendees of my talk. I will make sure to include that in my slides before I send them off. Speaking of which, the slides of the entire event (including mine) will shortly be made available via the DelphiPraxis forum as one big downloadable ZIP-archive. I will post the link here once it is available. So, nun bin auch ich zurück von den diesjährigen Delphi-Tagen in Hamburg und hatte ein wenig Zeit, die Eindrücke auf mich wirken zu lassen. Wie schon vielfach erwähnt, wird sich die Ausgefallenheit der Location wohl nur noch schwer übertreffen lassen (muss ja aber auch gar nicht – schließlich soll ja das Gesamterlebnis, die Leute, die Vorträge und nicht zuletzt Delphi im Vordergrund stehen). Großes Lob an Daniel auch für die Organisation des “pre-Con” Grillabends im Clubheim des FC St. Pauli wo man sich in netter Atmosphäre, mit leckerem Essen und einem schönen kühlen hanseatischen Bier unter die Delphi-Community mischen konnte, und dabei auch mal über andere Dinge, als nur Programmieren und Delphi reden konnte. Weiter ging es am Samstag Morgen. Die Veranstaltung war sehr gut besucht (ca. 250 Leute einschließlich Speaker und Aussteller, wenn ich Daniel richtig verstanden habe). 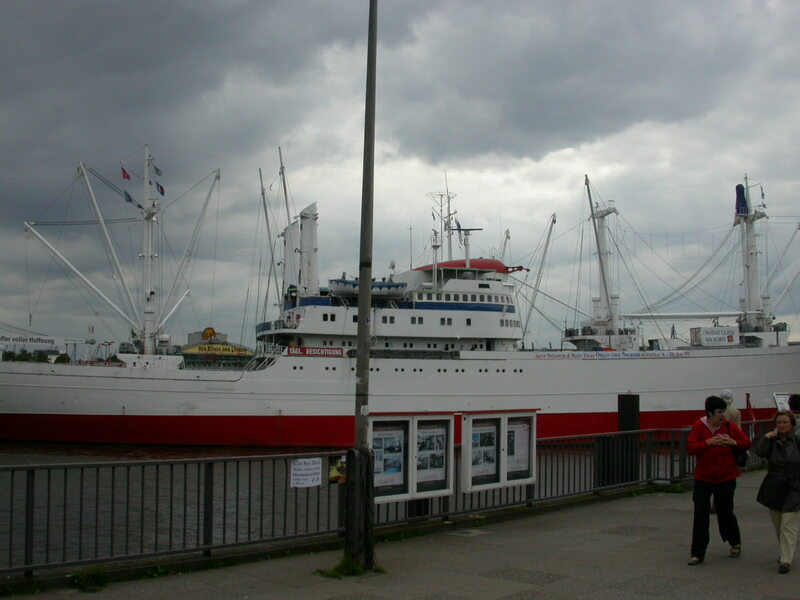 Besonders erfreulich fand ich auch die besonders große Anzahl von Leuten, die sich bei der abschließenden “Hände-heben”-Runde als Erstbesucher “geoutet” haben. Der Altersdurchschnitt lag meinem Empfinden nach auch etwas niederiger als bei früheren Events, was ja nur ein gutes Zeichen sein kann. Die Keynote von David I bot wenig Neues, sofern man die Berichterstattung zur Delphi Live!-Konferenz im letzten Monat verfolgt hatte. Trotzdem finde ich es immer wieder erfrischend, David reden zu hören. Man merkt einfach, dass er mit Leib und Seele bei der Sache ist. Weiter ging es mit den ersten Runde Sessions, wobei ich davon selbst leider nicht mehr viel mitbekommen habe, da ich die Kaffeepause nutzten musste, um einen kostengünstigeren Parkplatz für meinen Smart zu suchen. Zumindest die letzte Hälfte von Jeroens Vortrag über IDE-Addins und sonstige nützliche Tipps zur Produktivitätssteigerung konnte ich noch mit halben Ohr und Auge verfolgen – leider war der Raum so voll, dass ich nur im Durchgang zum Nebenraum stehen konnte, wo Bernd Ott einen ebenfalls sehr interessanten Vortrag zum Thema Subversion hielt. Danach ging es für mich ohne Pause weiter mit Bernd Uas Vortrag zu Softwaretests und DUnit, welchen ich aus ungewohnt luftiger Höhe verfolgt habe… (siehe Bild links). In der Zwischenzeit rückte mein eigener Vortrag immer näher und da dies der erste seit fast auf den Tag genau 9 Jahren sein sollte (abzgl. einem Monat), stieg die Anspannung bei mir entsprechend. Sakuras Vortrag über die Windows 7 Taskbar konnte ich leider entsprechend auch nur zur Hälfte verfolgen, da ich erst noch ein wenig Frischluft schnappen musste. Mein eigener Vortrag schließlich war eine gemischte Angelenheit: Zwar konnte ich meine Nervosität größtenteils noch ablegen und konnte auch alle Zwischenfragen beantworten, aber meine Entscheidungen zur Zeitaufteilung und Gewichtung der einzelnen Vortragsteile waren, im Nachhinein betrachtet, glaube ich nicht ganz ideal und obendrein reichte die Zeit leider gar nicht mehr für den abschließenden Teil zum Thema Extended MAPI und Redemption, wodurch ich zu diesem Thema nur noch im Eiltempo die Slides durchklicken konnte, anstatt echte Praxisbeispiele zu zeigen. Nun ja, wie sagt man: aus Fehlern lernt man. Ich werde versuchen, die zu kurz gekommenen Teile hier in Blog- und Videoform nachzureichen und es beim nächsten Live-Vortrag besser zu machen. Ich hoffe, es konnten trotzdem alle Anwesenden das eine oder andere für sich mitnehmen. Konkrete Fragen beantworte ich auch gerne hier im Kommentar-Thread. Den Ausklang des Tages im Gröninger Brauhaus fand ich schließlich auch sehr amüsant und gesellig (ich sag nur: “JUUUUNGS!! !” 😉 ). Das gehört für mich mittlerweile auch einfach zu den Delphi-Tagen dazu. Das erste, was ich schließlich heute morgen in meinem Posteingang fand, war ein 30%-Gutscheincode, welchen mir das Add-in-Express-Team etwas verspätet (um genau zu sein: 30 Minuten nach meiner Abreise am Freitag) für die Teilnehmer meines Vortrages zugesandt hatte. Ich werde diesen auf jeden Fall noch mit in die Slides einbauen, bevor ich Sie verfügbar mache. Apropos, die Slides der gesamten Veranstaltung, einschließlich meiner, wird es in Kürze über die DelphiPraxis als großes ZIP-Archiv zum Download geben. Ich werde den entsprechenden Link dann auch noch einmal hier posten. So, here’s the second example on creating Outlook-Addins with Delphi which will likely not be included in my talk at the German Delphi-Tage due to time constraints. In this one I show how to add an option page to your addin, which is typically used for letting the user configure your addin or for displaying version and contact information. Again, raw and unedited (I’m probably talking too fast in this one). Recorded at 1024×768 in English, 9 minutes and 28 seconds.